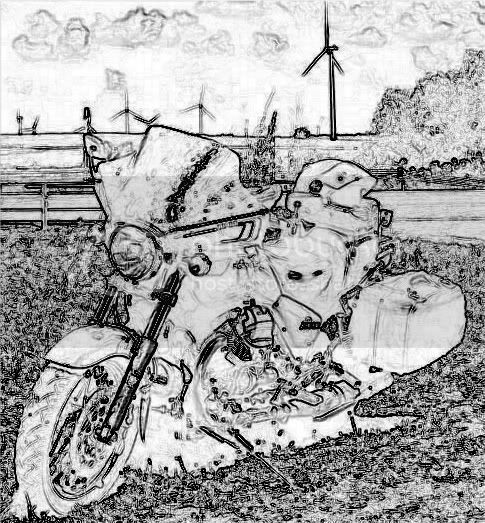 motorcyles and taking care of the "back 40"
Mechanical Engineer (prostitute ;D) for a company that rebuilds and retrofits machine tools. Married. Third time's a charm. Guzzis, ralies, waterskiing, and snow skiing. who needs therapy? i have a motorcycle!! We have horses, kids (3), and not much else! Married - very happily, 11 years. Hobbies: model and high-power rocketry, SCUBA, photography, growing & showing orchids. A Slovenian participant on Wildgoose Chase! Cool! Are you a member of the Slovenian Guzzi Club? I tried my best this summer to get to Slovenia to visti my friends from 2002, but I did not succeed. In a way it was a good thing because the motorcycle broke and by my calculations I would have been in Croatia on my way to Ljubjana if I hadn't gone north by ferry instead. Otherwise, I was sorry I didn't make it! 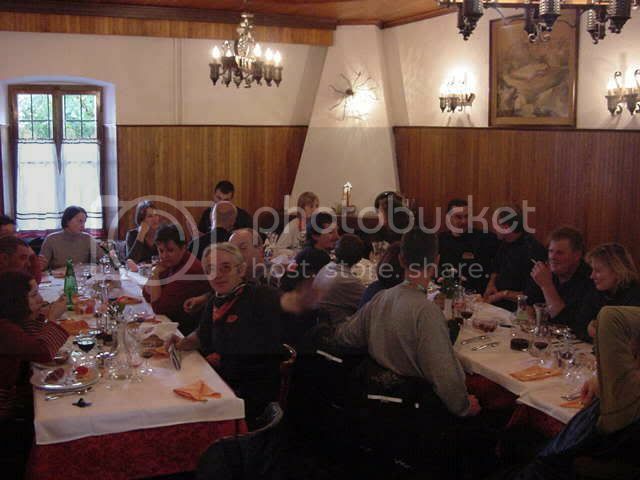 Slovenian Guzzi Club Dinner, 2002.... Nice people. My wife says the Guzzi cures her backaches much better than any meds or chiropractor ever has! like motorcycles, still fly a bit, guns, a little farming. never tire of seeing how interesting the people on this board are. and how helpfull when one of us needs a helping hand--thanks to all of you. GRiSO, he speaks to you, no? "What the hell is a Moto Gootsie?" I enjoy riding my LeMans III and camping at rallies. My experience with them in 2002 was truly a pleasure. They are great people, I met them in Mandello del Lario and then rode to Slovenia and took part in a ride around the country over a weekend. We had a party at some huge ex-communist era golf facility that was available for rent. So the whole club could stay there, out in the country. Man, it was crazy. I am on the right with Barbara Susnik, a Centauro rider now in Canada with the Slovenian embassy, and Tomaz Moravec on the left. Here we are having fixed the loose battery cables on the ST2 I was riding, Matteo Turturro is the other guy (from Italy). The party started right afterwards! Camping, Hiking, Road Trips, Bicycling, Jazz, Big Band, Movies, MST3K, T.O.P. Daily lurker on this site! Bled castle. What do I win? I've never met Barbara, but I've talked to her on the phone (I'm originally from Canada, and am in touch with the consulate in Ljubljana quite often). We live at the other end of the country, in Maribor. Thanks for the link. I'll get in touch with the club. PPS If you do get in touch with the Slovenian Guzzi club in person, give them my regards, and let me know how it goes! I'm an entomologist. Probably the only one here. (?) I've been educated well beyond my abilities and am living proof that if you don't live a virtuous life in the field you'll go to Management. Three kids. Two German Shorthairs. One argumentative woman. House in the country. Moderate carpentry skills. Wiring efforts usually pass the "lick two fingers..." test. Not good at tire-changing. Will hunt for food. Biology is destiny. Culture is ecology. Most things are beetles. Lep pozdrav in srecno pot! Yeah! Now I feel like I'm sitting around a campfire! Threw that in just in case! Live in Hog Mountain Georgia. The upitty yankees moving in don't like that name. My hobby is brewing beer. My other hobby is drinking it. To fund my hobbies, I write manufacturing test software and design barcode readers. I live in a motorhome...actuall y a school bus that's been converted to a motorhome. Currently at Mormon Lake Lodge in northern Arizona. Fixin to move to a warmer climate in about 3 weeks.